Robinson and Swenson were both at Campaign for America’s Future “Take Back America” conference here June 13. In its fourth year, the annual Take Back America conference opened with 2,000 attendees. Representatives from progressive, liberal and labor movements, like Biko Baker, organizer for the National Hip-Hop Convention, rubbed shoulders with Lynn Williams, president of the Steelworkers Organization of Active Retirees. Senate Democrat Minority leader Harry Reid (D-Nev.) surprised the conference with a call to start the troop withdrawal from Iraq. “Iraq is not a matter for future presidents, as President Bush has said,” he charged. “It’s his war and it’s his responsibility.” He warned attendees of the Bush administration’s campaign of “distort, distract, divide” to continue their right-wing stranglehold on power as the November state and congressional elections inch closer. Former presidential candidate Sen. John Kerry drew numerous standing ovations after beginning his speech with, “I was wrong to vote for this war.” He called for renewed courage and dissent from Bush policies in the halls of Congress and in the streets, saying, “It is our right and obligation to stand up to the president. It is immoral to be silent.” He announced that he was starting a floor fight in the Senate next week to set a date to bring the troops home. Robert Borosage, co-director of the Campaign for America’s Future, told the conference that the country is at a “tipping point” but warned that doesn’t necessarily translate into changing the occupants of Congress. CFA polling indicated the majority of voters want national security based on building allies; that the government should regulate corporations, free scientific and medical research from right-wing religious restrictions, guarantee national health care, develop energy independence and invest in public education. The conference launched a drive for energy independence through clean, renewable sources. 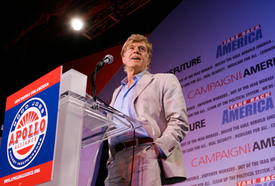 Actor Robert Redford joined Jerome Ringo of the Apollo Alliance to advocate for a pro-labor environmental program. Redford said that he had been an outdoorsman since his youth. In the early 1980s his Sundance Institute hosted a meeting of U.S. and Soviet scientists who convinced him, and scores of other activists, that global warming was the product of fossil fuels, like oil, and threatened the existence of the planet. “Their prediction came true,” Redford told reporters. Borrowing its name from the 1960s space program, the Apollo Project, the Apollo Alliance plan calls for a federal $300 billion investment in energy efficiency over 10 years that would create 3.3 million jobs. The conference highlighted the initiative by presenting their annual “Right Stuff” award to United Steelworker President Leo Gerard. The USW is a member of the Apollo Alliance’s national steering committee and recently forged a new coalition with the Sierra Club and National Wildlife Federation. Joelle Fishman, chairwoman of the political action commission of the Communist Party, who has attended previous “Take Back America” conferences, said this year’s conference made some breakthroughs.